Jakarta’s property market, along with the rest of the economy, is booming, with the prices for residential housing in many prime locations up by at least 10% last year, sometimes as high as 20%. The residential market, defined as landed houses, condos and apartments, is doing especially well in the southern end of Jakarta. Areas popular with expatriates, such as Kemang, Kebayoran, Pondok Indah and Jalan TB Simatupang have seen significant price gains as they are close to international schools and also are relatively close to Jakarta’s main business districts. Rental prices in these areas on the rise, which in turn drives sale prices, says residential investment specialist Eka Heru Djunaeni, associate director of property consultant Colliers Indonesia. “In Kemang, land prices last year were Rp10 million per square meter on average, not including the building, but now they are already asking for Rp12 million for the best spots,” Eka says. 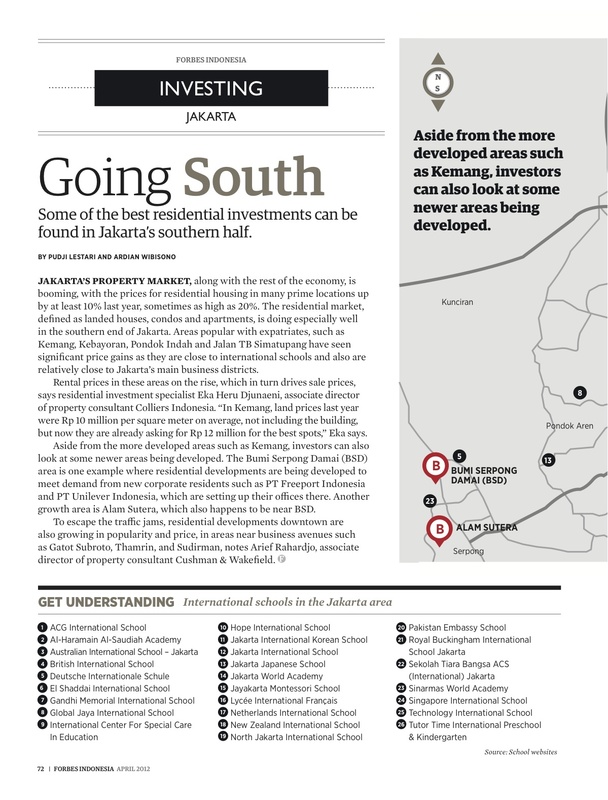 Aside from the more developed areas such as Kemang, investors can also look at some newer areas being developed. The Bumi Serpong Damai (BSD) area is one example where residential developments are being developed to meet demand from new corporate residents such as PT Freeport Indonesia and PT Unilever Indonesia, which are setting up their offices there. Another growth area is Alam Sutera, which also happens to be near BSD. Eka adds expatriate workers need for housing is the determinant factor that has making south and southern Jakarta interesting place for upper class residential. Beside the quality of infrastructure and its access, other factor is the existence of office center and international school within the area. This explains why expatriate worker in property area like Bumi Serpong Damai is rising. This has also making it difficult to find the suitable house in south area. Colliers also projected that Jalan T.B. Simatupang is going to be the next CBD area. This will lift the surrounded area like Pondok Indah, Kemang, Cilandak and Cipete into much developed area. To escape the traffic jams, residential developments downtown are also growing in popularity and price, in areas near business avenues such as Jalan Gatot Subroto, Thamrin, and Sudirman, notes Arief Rahardjo, associate director of property consultant Cushman & Wakefield. The consultant focusing their residential data on condominium and rental apartment in central business district (CBD) area and prime area. The CBD means area in the three main roads mention above and Kuningan area, stretch from Central to South Jakarta. 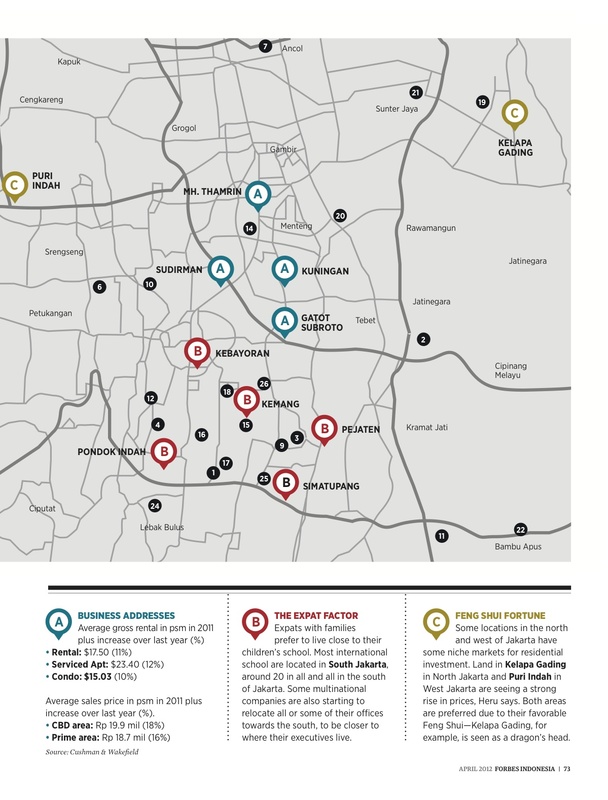 While prime area is within Pakubuwono, Kemang and Pondok Indah in South Jakarta. “For residential the market character in 2012 is likely still the same. It is supply driven, but the market took it well,” he says. For rental apartment, service apartment is the most desirable. It can also be rent daily for corporate meeting or family usage during weekend. While condo for lease is more competitive because its own by individual. CBD is also a favorite location for investing to Colliers. It includes Kebayoran such as Jalan Senopati. Kebayoran is a trending area, where the asking price for a house like in Jalan Sriwijaya to reach Rp 62 million per square meter. The rental cost $4,000 to $7,000 per month is one of the reasons for the land price broke a record. But like in Menteng, Central Jakarta, in these kinds of area, it is very rarely a landlord wants to sell the house. Cushman & Wakefield data shows condo supply last year was dominated by South Jakarta (28%). It also predicts the domestic tenant to continue increasing in 2012. While the growth of land price continue to rise, 9.5% in CBD and 7.7% in prime residential area, but tougher competition in 2012 will hold price back to slower growth. Even though the trend is going south, places like Kelapa Gading in North Jakarta is the exception. Chinese descendants prefer to stay in here because according to feng shui it is represent the dragon head, a place that is believe as to bring luck since dragon is the symbol of luck. Other area like Puri Indah in West Jakarta is also the favorite place for this descendant. 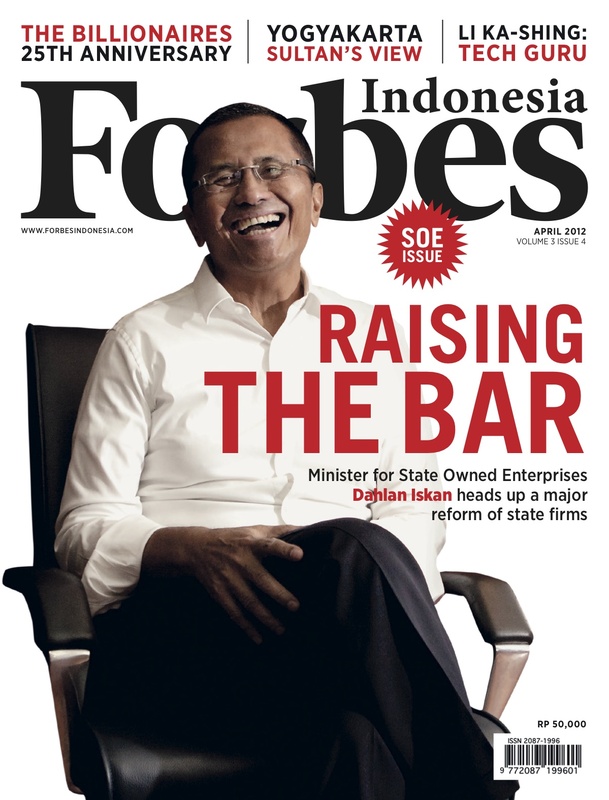 * This story appears in the April 2012 issue of Forbes Indonesia. The grey highlight is additional for the blog. This entry was posted in Ideas, Publications and tagged Alam Sutera, Bumi Serpong Damai (BSD), business district, international schools, investment, Jakarta Central Business District, prime location, property, residential by Pudji Lestari. Bookmark the permalink.